Engraving of Dolley Madison, circa 1873 (Image credit: Getty Images). Born Dolley Payne, Dolley Madison (May 20, 1768 – July 12, 1849) was first lady of the United States as the wife of James Madison, the country’s fourth president. Over the course of her tenure as first lady, she was instrumental in forging friendly and social relationships between members of different political parties. Died: July 12, 1849 in Washington, D.C. Known For: As first lady, Dolley Madison influenced bipartisan efforts and was known for her grace and charm as a hostess. Dolley was the first daughter of Mary Coles Payne and John Payne Jr., Virginian transplants to North Carolina. Her mother was a lifelong Quaker, and her father joined the faith upon marrying Mary in 1761. In 1769, the Paynes returned to Virginia, where they raised their children on the family plantation. As a child, Dolley was very close to her mother’s family. The Paynes had four daughters (including Dolley) and four sons. As Quakers, the family was somewhat anti-slavery, and in 1783, they emancipated all their slaves. That same year, when Dolley was fifteen, the family moved again, this time to Philadelphia, where John Payne started a business as a starch merchant. Unfortunately, his business failed by 1791, resulting in his expulsion from the Quaker community. He died in 1792. In 1790, when she was 22 years old, Dolley married John Todd, a Quaker lawyer whom she met in Philadelphia. They soon had two sons: John Payne Todd (named for Dolley’s father) and William Temple Todd (born in 1793). Her sister, Anna Payne, also moved in to help with the children. Tragedy struck in 1793, when a yellow fever epidemic tore through Philadelphia, killing more than five thousand people over the course of four months. Dolley lost her husband, her son William, and her in-laws to the epidemic. In the aftermath, she was stuck dealing not only with her grief and raising her surviving son, but with the legal limitations placed on women inheriting. Because her brother-in-law was the executor of her husband’s will, he was able to withhold her inheritance from her until forced to retract after a lawsuit. At the time, laws around women’s financial rights left many women in positions like Dolley’s. Because women were severely limited in their ability to earn money or own any property, they were almost entirely financially dependent on male relatives, under a system known as coverture—the doctrine that essentially subsumed all of a woman’s rights into her husband’s upon marriage. Dolley was a young widow, only 25 years old, and was considered a very beautiful woman. Living in Philadelphia, the temporary capital of the new United States, resulted in Dolley encountering many of the elite figures of the time. Dolley was staying at a boarding house, where the lawyer Aaron Burr was also living. Burr had attended college with James Madison, who was then representing Virginia as a congressman in the House of Representatives. Reportedly, it was Burr’s idea to introduce his old friend and his neighbor. In early 1794, Burr introduced the two, and they apparently hit it off quickly. 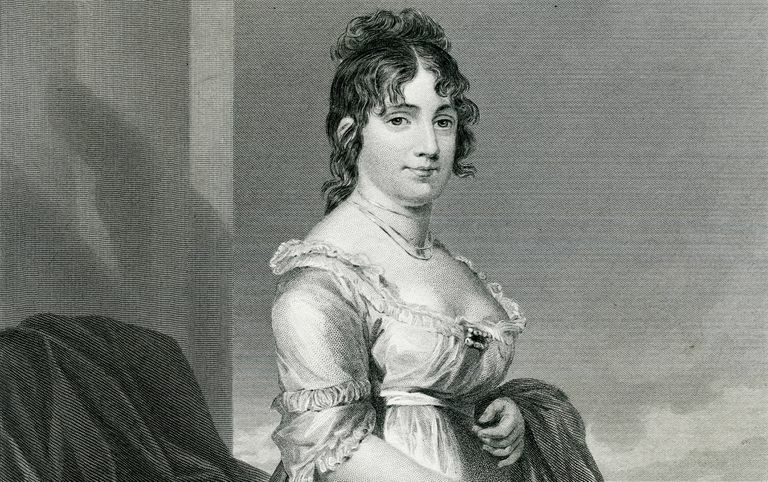 Although Dolley would have been aware of the necessity of remarriage in order to support herself and her son, she and Madison did apparently care deeply for each other—despite an age gap of seventeen years. They married that September, resulting in Dolley’s expulsion from the Quaker community for marrying outside her faith; she adopted James’ Episcopal faith instead. Madison served eight years in the House of Representatives before retiring from politics in 1797. Their family returned to Virginia, where Dolley helped her husband expand their house on his estate of Montpelier. However, the retirement didn’t last long. In 1800, Thomas Jefferson won the presidency, and he asked Madison to take the post of Secretary of State. Madison accepted, and he and his family moved to Washington. Because Jefferson was a widower, Dolley stepped in to fulfill some of the traditional functions of the first lady, as set out by Martha Washington. She assisted in furnishing the White House and served as hostess on several state occasions, while also befriending the wives of many international diplomats. During this era, she gained a reputation for her charm and graciousness. Madison was the nominee of the Democratic-Republican Party in the 1808 election and won the presidency; he was reelected four years later as well. She functioned as the official hostess of the administration, smoothing over political tensions with her grace and social finesse. It was her social events, in fact, that helped bring together politicians of different parties. During her tenure as first lady, Dolley also participated in the advances of the ages: she was the only first lady given an honorary seat on the floor of Congress, and the first American to receive and reply to a telegraph message. Dolley’s most famous action came in 1814—and, technically, it wasn’t even hers. During the War of 1812, British forces attacked Washington and burned much of the relatively new city. As the presidential staff hurried to depart, Dolley ordered that a painting of George Washington, a copy of the famous Lansdowne portrait, be taken down and saved. In popular culture, Dolley was depicted as the one who saved the painting, in reality, it was the house’s servants (or, more accurately, slaves) who did the saving. After Madison’s tenure as president ended in 1817, the family returned to Montpelier, where they enjoyed retirement. James Madison died on June 28, 1836, and Dolley spent the next year organizing and copying his papers for their records and for publication. She then returned to Washington, along with her sister Anna, in 1837. The Montpelier plantation was left in the care of her son, Payne Todd, but he suffered from alcoholism and other illnesses and was unable to carry out his duties properly. Instead, Dolley sold off Montpelier and the plantation’s remaining slaves to pay off her family’s debts. In her later years, Dolley Madison remained a fixture in Washington, as one of the last remaining members of the prominent Revolutionary War families. Over the years, her finances were intermittently shaky, and she sold the rest of her husband’s papers to help support herself. She passed away at the age of 81 at her home in Washington in 1849, and was first buried in the Congressional Cemetery in Washington, then reinterred alongside James at Montpelier. Along with other early presidential wives such as Martha Washington and Abigail Adams, Dolley Madison defined the role of the first lady and used social gatherings to work towards bipartisan cooperation in a chaotic era. Allgor, Catherine. A Perfect Union: Dolley Madison and the Creation of the American Nation. New York: Henry Holy & Co., 2006. “First Lady Biography: Dolley Madison.” National First Ladies Library, http://www.firstladies.org/biographies/firstladies.aspx?biography=4. Howat, Kenna, ed. “Dolley Madison.” National Women’s History Museum, https://www.womenshistory.org/education-resources/biographies/dolley-madison.